Farsight Recruitment | Community | all | Figure it out! Major debate has swept the Farsight office with our latest competition... so much so we had to get a mathematician in to help us decide who was right! Now it's up to you - figure out this 'simple' maths equation, comment your guess and if you're right then you will be in with a chance of winning £30 Screwfix vouchers to spend on whatever you choose! Competition ends on Friday 29th of July. Good luck everyone - Winner will be chosen at random from all correct guesses. Congratulations to our winner - Christopher Ross from London! 1. The following rules apply to your participation in our July 2016 ‘'Figure it out' Competition. 3. To enter: No purchase necessary. Internet access, a Facebook, Twitter or LinkedIn account required to participate. To enter via Facebook: First “Like” the Farsight Recruitment Facebook page, then comment your guess on the picture. 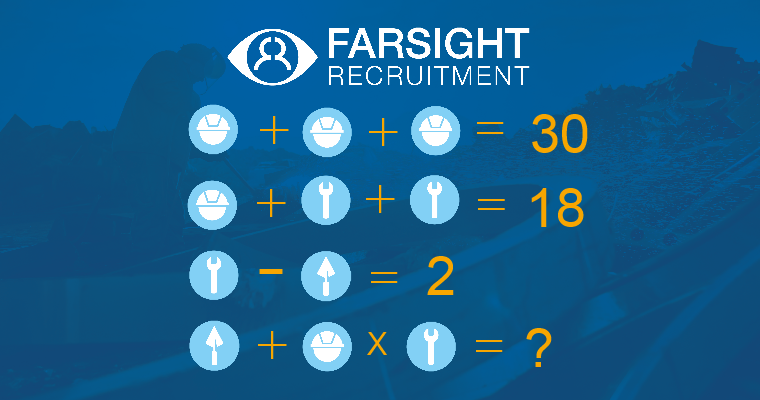 To enter via Twitter first 'Follow' the Farsight Recruitment account then tweet us @Farsight_uk with your answer. Entry is limited to one single entry per person, per social media platform. The Promoter reserves the right to refuse any entry for any reason at its absolute discretion. 4. Promotion period runs from 25th July 2016 to 12pm on 29th July 2016 inclusive. All entries must be received within this time. 6. Prize: There will be only one winner which will be chosen at random from all entries made. The prize is £30 screwfix vouchers that will be sent through the post to the winner. I believe the answer is 16. I could be wrong.